Dreamland is a duo of Johnny A. Rodriguiz and James H. Sidlo accompanied by several special guests. Most of these tracks were recorded live (2 on KSYM Radio, San Antonio, Tx and 1 in Clippership Bookstore). The opening track, "Sunspots", is quite dreamy, but then some far out guitar pans in and it sounds very 3D in the headphones. Johnny plays some Native American Indian flutes on this track as well, which are very cool. The mix is all over the place. Quite an appropriate title for this song. "I Frequency, Dream In Soundwaves" is next and is mainly a vocal experiment by Johnny for the majority of the track. "Brief Moon" is a solo guitar track with some interersting looped effects. 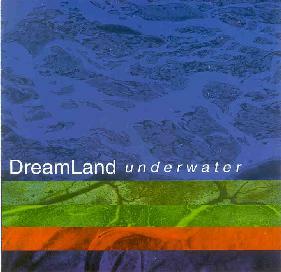 The final track, "Underwater" is a 5 piece track and reminds me a bit of some of the spacier moments of Pink Floyd. Quite a good experimental space music CD. For more information you can visit the Uncle Buzz web site at: http://www.unclebuzz.com or the Dogfingers web site at: http://www.dogfingers.com.